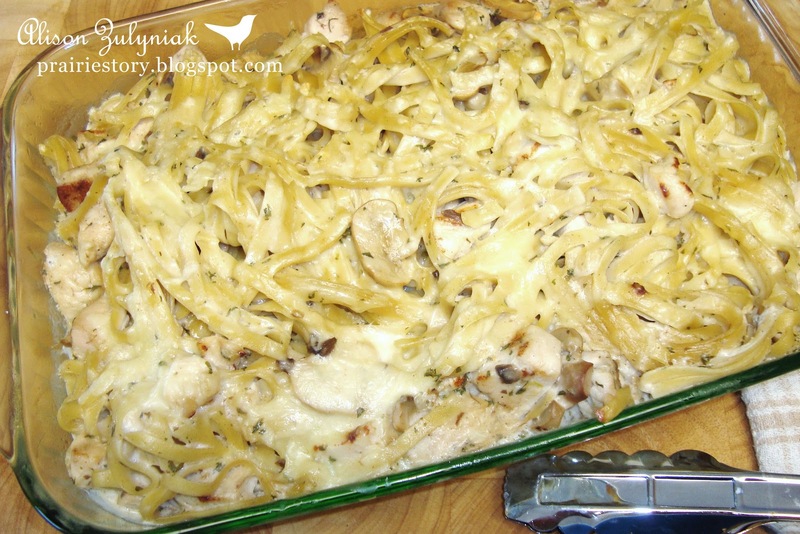 Tetrazzini usually involves a thin pasta, poultry or seafood, mushrooms, and sometime nuts in a creamy parmesan sauce. There are many variations and mine includes Roasted Garlic! Tetrazzini is actually an American dish invented by a chef in a hotel that the Italian opera star, Luisa Tetrazzini frequented. - Brown onions and chicken in olive oil in fry pan, season generously with salt & pepper. - In a large mixing bowl combine cooked fettuccine (or linguine, or spaghetti) with chicken mixture and the rest of the ingredients. - Place in greased 9x13 baking dish and cover with aluminum foil. Your chicken dish looks wonderful. I cannot wait to try it out. Looks fantastic! I love creamy casseroles. Love this! What's best is I have everything on hand to make it tonight! Yum. I picked you for the Stylish blogger award! You can go to my blog and copy and paste it to yours. Keep posting those delicious recipes! I'm visiting from Life as Mom. I know I'm probably the only one thinking this but is that Mushroom soup-cream of mushroom, golden mushroom or just plain mushroom soup? فنحن خبراء فى ذلك الميدان ونعد الاوائل فيه فى المملكة بالكامل وليس بمكة لاغير معلوم عنها الدقة فى تطبيق مايطلب منها من اعمال وبالالتزام بالمواعيد وبالسعر الغريم كذلك.